Coll. No. 1588, 18 April 2017, characters observed: Annual, 18-25 cm., taller than wide, pustulate appressed hairy throughout; Leaves, cauline, alternate, sessile, 20 mm. × 3 mm. 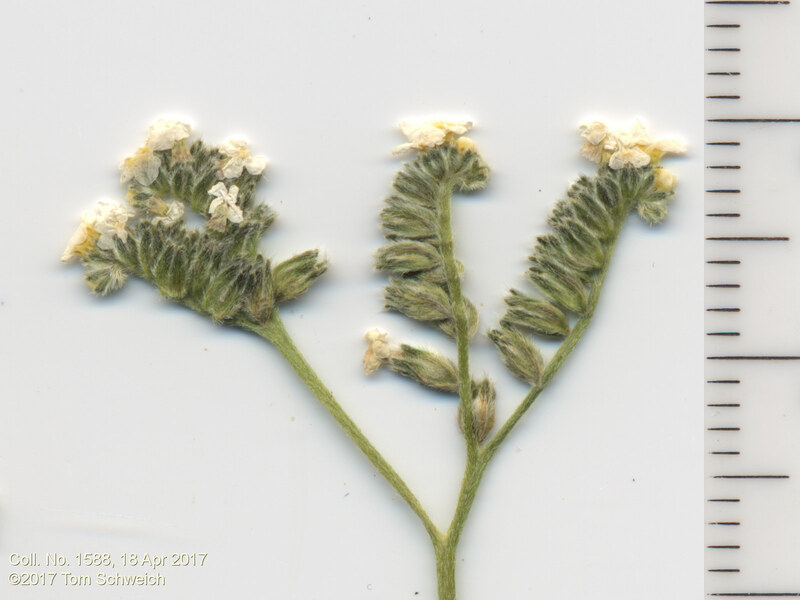 wide, margin entire; Inflorescence, not bracteate; Pedicel, 0 mm. ; Calyx, rounded at base, 2.7 mm. × 1.7 mm. wide, 3 mm. in fruit, hairs straight (not hooked) throughout; Corolla, limb 2.6 mm., white; Nutlets, generally #1, ventral groove central, margin sharp but not flattened or wing-like, papillate with few small spines. Keyed with Simpson & Hasenstab (2009). Field Notes: Coll. No. 1588, 18 Apr 2017. Other photos about Species - Boraginaceae or Boraginaceae Cryptantha utahensis.